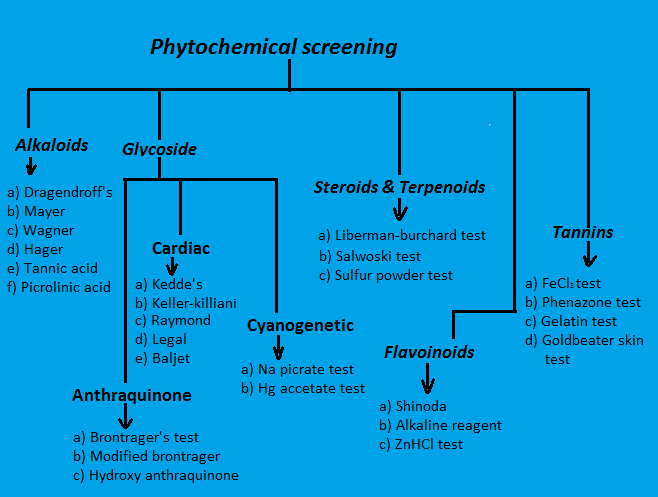 Phytochemical screening is done to identify the nature and type of constituents present in a drug. This technique is of extreme help when a new drug is being investigated for the chemical constituents. 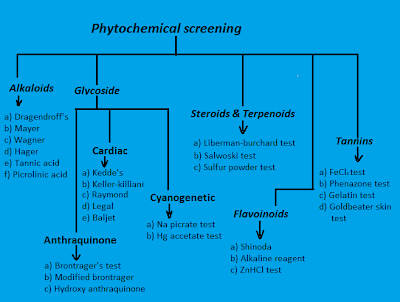 In phytochemical screening there are both general and specific tests for finding the nature of chemical constituents in the drug. This topic is very simple and short but contains due weightage in the GPAT due to its importance in the pharmacognosy. Here I am discussing the topic in detail stressing on the regions important from the perspective of GPAT. This image can be used only by giving a link to this article. Alkaloids are tested by the following reagents. Each reagent or test has accuracy and specificity. i) Dragendroff’s reagent- This reagent is constituted of potassium bismuth iodide. Alkaloids give reddish brown color with the dragendroff’s reagent. ii) Mayer’s reagent- This reagent is constituted of potassium mercuric iodide. Alkaloids give cream color with the mayer’s reagent. iii) Wagner’s reagent- This reagent is constituted of iodine potassium iodide. Alkaloids give reddish brown precipitate with the wagner’s reagent. iv) Hager’s reagent- This reagent is constitutes of picric acid. Alkaloids give yellow precipitate with the hager’s reagent. v) Tannic acid- With tannic acid alkaloids give buff colored precipitate. vi) Picrolinic acid- Yellow colored precipitate are produced with picrolinic acid. Test A- Dissolve the 200 mg drug with sulphuric acid. Then, add 5% NaOH solution for neutralization. Add fehling solution A & B to the above mixture. Red color is produced. Test B- Dissolve the 200 mg drug with sufficient amount of water. Add further water to dilute the solution. This solution is tested with fehling solution A & B. Red color is produced from the reducing sugar present in the drug. Compare the red color from the two tests of the drug. If the color of test A is more intense than test B; glycoside presence confirmed. · Brontrager’s test- This test is performed for the O-glycosides. Drug is dissolved in 1ml H2SO4 and mixture is boiled. Filter the solution, filterate is then mixed with chloroform. Chloroform layer mixed with ammonia gives rose pink color if O-glycosides are present. · Modified brontrager’s test- This test is performed for the investigation of C-glycosides. Drug is mixed with H2SO4 and FeCl3. The next procedure is same as for the O-glycosides in brontrager’s test. · Hydroxy anthraquinones- Drug is mixed with potassium hydroxide. If hydroxy anthraquinones are present red color is present. Kedde’s test- Extract the drug with CHCl3. 90% alcohol with 2% 3,5 dinitrobenzoic acid is added to the extract. To this mixture 20% NaOH is added. Purple color confirms the presence of cardiac glycoside. Keller-killiani test- This test is performed only for the digitoxose sugar moiety. Drug is extracted with chloroform first. 0.4 ml acetic acid is added then along with FeCl3. After adding H2SO4 if purple color is produced in the acid layer then presence of digitoxose sugar confirmed. Raymond’s test- Reagent used in this test is methanolic alkali. Violet color confirms the presence of cardiac glycosides. Legal’s test- This test is performed by using pyridine and alkaline sodium nitroprusside is used. Red color is produced if cardiac glycoside is present. Baljet test- Reagent used in this test is picric acid and sodium picrate. Orange color is produced in the presence of cardiac glycoside. Sodium picrate test- Drug is mixed with dilute H2SO4. After the addition of sodium picrate red color is produced in the presence of cyanogenetic glycoside. Mercuric acetate test- After mixing the mercuric acetate with drug. Drug acetate is formed and mercury is separated out which confirms the presence of cyanogenetic glycoside. i) Liberman-Burchard test- Drug is mixed with acetic anhydride. To this mixture con. Sulfuric acid is added. There forms two layers with browning at the junction. Upper layer with green color represents steroids whereas lower layer represents terpenoids red color. ii) Salwoski test- Drug is mixed with con. sulfuric acid. Upper layer is of steroids which are red in color and lower yellow colored layer represents trirepenes. iii) Sulphur powder test- If sulfur is added to the mixture of drug, sulfur sinks down the mixture. i) Shinoda test- Shinoda test is performed by adding magnesium along with the HCl in the drug mixture. Red/pink/green to blue color confirms the presence of flavonoids. ii) Alkaline reagent test- As the name suggests, an alkaline reagent is used for this test. Sodium hydroxide is added to the drug. Yellow color is produced; if on addition of dilute acid this color disappears then it confirms the presence of flavonoids. iii) ZnHCl test- Flavonoids give red color with the Zinc hydrochloride. i) Gold beater’s skin test- This is most common test for tannins. This test is performed on the membrane of OX. Goldbeater’s skin is first treated with HCl and rinsed with distilled water. After this, this skin is paced in the solution of drug and rinsed with water. After addition of 1% FeSO4, brown or black color is produced in the skin due to the presence of tannins. ii) FeCl3 test- Yellow color is produced with FeCl3 in the case of hydrolysable tannins whereas condensed tannins give green color. iii) Phenazone test- Sodium phosphate is mixed with drug and filtered. To the filtrate phenazone is added which produce precipitate if tannins are present. iv) Gelatin test- Precipitate is produced with gelatin which confirms the presence of tannins. i) Volatile containing drugs when mixed with alcoholic solution of sudan III gives red color. ii) Volatile oil containing crude drugs also produces red color with tincture alkane.